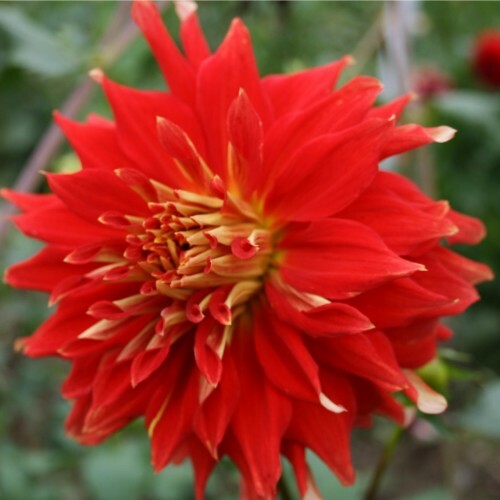 Dahlia tubers make great Christmas gifts, Hanukkah gifts, Kwanzaa gifts, Winter Solstice gifts, and gifts to celebrate Eid, Samhain, Epiphany, Chinese New Year, Pancha Ganapati or any other winter festival. 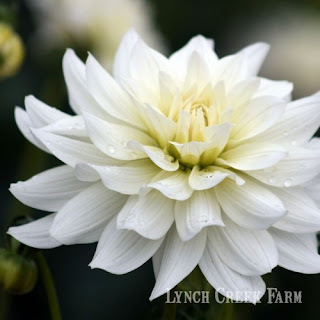 Of course nobody's going to be planting dahlias this time of year, and Lynch Creek Farm won't ship dahlia bulbs (correctly speaking, dahlia tubers) until the weather warms. But your gift recipient can receive notice that the beautiful dahlia tubers you've chosen are reserved for him or her, and that your thoughtful gift will arrive at the appropriate time for planting wherever he or she lives. What could be more delightful, during the cold days of winter, than receiving a holiday card announcing the gift of flowers: not a bouquet of flowers to last a week, but months of blooming delight, year after year? to provide cool blooms in summer's heat. Does holiday color sound enticing? Among the many colorful offerings at Lynch Creek are "Cherry Drop," a bright red waterlily dahlia with compact form; "Nicky K," a spiky, showy laciniated pure red; and "La Bomba, a red and deep wine red combination collarette. Several dahlias come in candy-cane red-and-white combinations. Consider "Ringo," a small formal decorative with white tips on rich red florets; or the dramatic "Wildman," a giant red semi-cactus dinnerplate dahlia in brilliant red splashed randomly with white. "Wildman" is a big, exuberant dinner-plate dahlia. What could be more in keeping with the season than "Snowbound," a big, white formal decorative dahlia; "Snowflake," a stunning white five-inch waterlily type; "Brookside Snowball," a white ball dahlia, or even "Blizzard," another formal decorative dahlia? There are dozens of other wonderful colors and color combinations to choose from; color, after all, is the essence of dahlias. A few minutes of scanning the gorgeous dahlias on the Farm's dahlia site will help chase away winter doldrums, but you may find making choices difficult. Or you can make it easy on yourself: purchase a dahlia tuber collection. 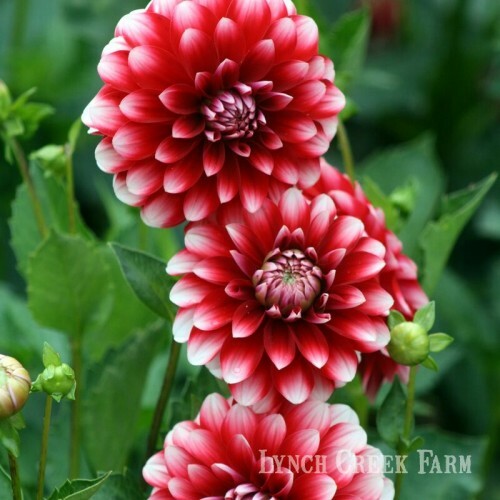 Collection offerings include the experts' selections of staff favorites from the colorful collarettes, petite pompons, splashy big dinnerplates, the best of the cut-flower dahlias, and even (now here's a gift that's sure to impress) a collection of all the Farm's collections.